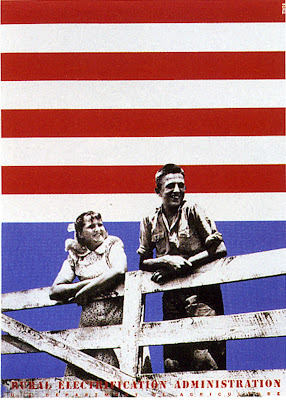 “Beall was responsible for taking American graphic design of the 1930s out of its mundane, tasteless form into the beginnings of what we know now as effective visual communication,” said renowned designer Herb Lubalin. Because of his varied interests and extensive reading, Beall utilized a variety of influences in his work, blending the new typography of Tschichold, the Dada movement’s intuitive placement of elements and 19th-century American wood types. Beall sought visual contrast and a rich level of information content. Prime examples of this are his poster campaign in the late 1930s for the Rural Electrification Administration." 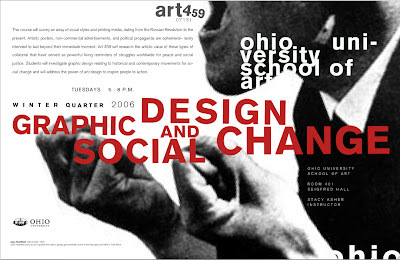 Art 459: Graphic Design and Social Change was introduced as a 400 level course at the Ohio University School of Art in 2006. The course surveyed an array of visual styles and printing media, dating from the Russian Revolution to the present in the form of artistic posters, non-commercial advertisements, and political propaganda. These types of collateral are ephemeral– rarely intended to last beyond their immediate moment. During the course, groups of students were assigned specific historical events or social movements to research and present relevant examples addressing the power of art and design to sway public opinion, organize and inform. A resulting DVD and website addresses the impact of this type of visual culture with the intent of informing art activists of the power of art/design to inspire people to action.